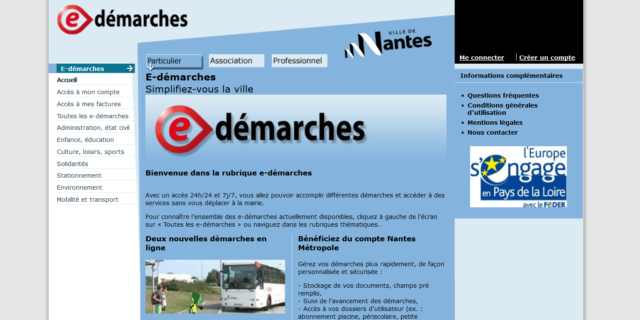 E-démarches is a web-based platform created by the city of Nantes, in order to facilitate administration and public services for the citizens. With access 24/24 hours and 7/7 days, citizens are able to complete different procedures and access services without necessarily going to the town hall. The platform exists since 2011 and in 2017 it is going to be accessible via smartphones and tablets. Further simplifications are planned, as well as gateways to other administations to avoid having to provide several times the same documents. Users are able to access the platform creating their own account as individuals, as associations or professionals. In all cases, the platform is connected to Nantes Métropole platform and have access to all their personal documents and other information including bills, taxes etc.